On July 16, 1945 the first experimental atomic bomb was exploded at the site known as Trinity at Alamogordo, New Mexico in the desert called Jornada del Muerto (Journey of Death) . It marked the beginning of a journey toward what could someday be the ultimate manifestation of death. The rest is history (and some of it particularly horrific history); and that history is still being written each day as many nations (led by the model of the United States) continue to rely on nuclear weapons while others seek to develop them. Then there are those nations (most of the non-nuclear weapons nations) that are rightly calling for an end to this madness. The United Sates should be leading the world toward disarmament and abolition, but instead we continue to utilize the archaic and flawed rhetoric of "strategic nuclear deterrence" and "national security," and have found a host of new enemies since losing the original justifications for our Cold War enemy the Soviet Union. That being said, we are, in fact, re-igniting that Cold War relationship (now with Russia) so many years later. As a result we are re-building the infrastructure that made Trinity - and over the years tens of thousands of nuclear weapons and the systems designed to deliver them to their targets - possible. Billions have been, and continue to be, spent on the US nuclear weapons complex. These huge investments represent, according to the National Nuclear Security Administration, the resources necessary to "to transform a Cold War nuclear weapons complex into a 21st Century nuclear security enterprise." There seems to be no end in sight! The government is in the early stages of planning for a new nuclear-capable bomber, and proponents of the Long Range Stand-Off (LRSO) cruise missile are pushing hard to get it approved by Congress. The Air Force is pushing ahead for funding of a new generation of land-based (Intercontinental Ballistic) missiles, as evidenced by the White House's fiscal year 2017 (FY 2017) budget request. 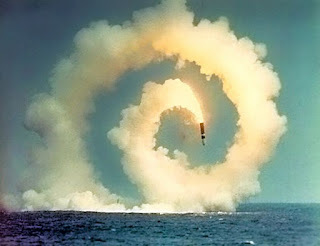 Then there is Trident (the Ohio class submarines), what the U.S. Navy calls “the nation’s most survivable and enduring nuclear strike capability.” Not only is Trident "survivable and enduring," but it is a significant weapon system of mass destruction and ironically, should Trident ever fire its Trident missiles in anything other than one of the many tests conducted by the Navy, the conflagration that follows will threaten the very survival of humanity. 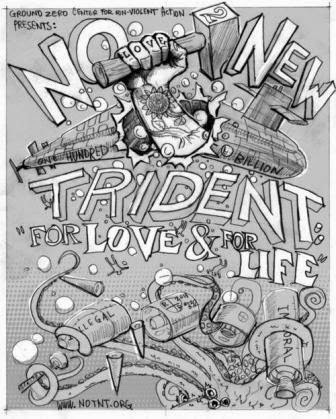 With 24 Trident missiles, each missile carrying up to 8 independently targetable nuclear warheads, and each warhead having an explosive yield of as much as 475 kilotons, just one Trident submarine is capable of incinerating much of any continent and rendering the land uninhabitable for anyone unfortunate to survive the initial blast, heat and radiation effects. 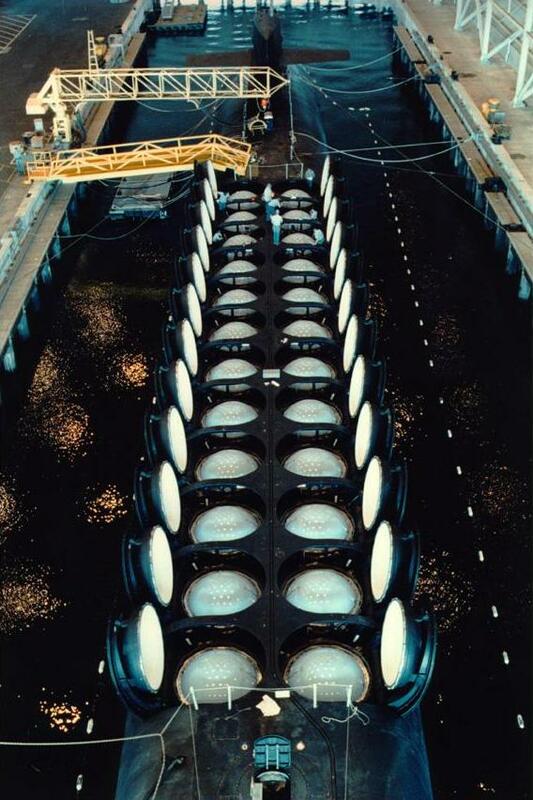 The U.S. has 14 Trident subs outfitted for the Trident II D5 missile. Research has concluded that even a small scale, regional nuclear war would result in a nuclear famine of massive proportions. Advocates of US nuclear modernization point to Russia's and China's modernization efforts to justify the need for new and improved US nuclear weapon systems. In reality, the US has led Russia and China into what is rapidly becoming a new nuclear arms race. As for ballistic missile submarines, the Russian program languished for years after the fall of the Berlin Wall and. Since then the US has added a newer and more capable missile (the Trident II D5), introduced an improved version of the W76 (100 kiloton) warhead, and increased Trident's presence in the Pacific (roughly 60 percent of all Trident patrols are in the Pacific). With the US currently well into the research and development phase of planning for a new generation of ballistic missile submarines, the SSBN(X), it should be no wonder that Russia is responding. Although Russia stopped building new SSBNs at the end of the Cold War, it has been catching up (slowly) and is currently working to achieve parity, and has been building a new SSBN class (Borei) that has been deploying to the Pacific. As Hans M. Kristensen of the Federation of American Scientists states it, "Russia is following the examples of the United States and China, both of which have significantly modernized their SSBN forces operating in the Pacific region over the past decade and a half." All of this, 71 years after the sun rose twice over the New Mexico desert, is moving humanity closer, once again, toward the brink. Rather than lead the way toward a nuclear weapons-free world, President Obama has been leading what will become (should subsequent presidents continue to fund it) "the biggest U.S. buildup of nuclear arms since Ronald Reagan left the White House." Although word is out in just the past week that President Obama may take steps in his final days in The White House to implement nuclear policy changes, this still remains to be seen. President Obama should take a number of immediate and practical steps to reduce the risk of either accidental or intentional nuclear war. Beyond that, he should should heed the lessons to be learned from the relationship developed between President John F. Kennedy and Soviet Premier Nikita Khrushchev (that likely brought the Cuban Missile Crisis to a peaceful resolution) and begin a conversation with President Putin to not only ease tensions, but to begin a meaningful path toward mutual security and disarmament. It is no understatement to say that the fate of humanity rests in the hands of the nuclear-armed nations, particularly the US and Russia. Should the Presidents of the two largest nuclear-armed begin to show the other nations a path toward abolition, we can begin to move further back from the brink. And then we can begin to have the serious conversation about scrapping Trident (and all nuclear weapons) and ensuring that the sun will never again rise twice some day.